The recipe in my book, page 70, does not call for celeriac as one of the ingredients, but it lists "thinly sliced tender celery ribs" which I used. All ingredients were used, but my spouse and I found it too bland to really be an enjoyable soup. As a last resort, I did add to my bowl of soup, "piment d'Esplette' which was a waste of this wonderful spice and added nothing to our enjoyment. Delicious soup. Pass through a food mill prior to combining with cooking liquid, as necessary, and escarole. Though I bought and soaked the beans overnight the day before making the soup, some of the skins on the beans didn't disintegrate as I'd hoped. The flavors are wonderful as is the cooking method for the beans. I'll stir in another teaspoon of salt when checking the status of the beans after 90 minutes next time. This is going to be a fall/winter staple. And begs for eperimentation. I served it with Cholula hot sauce. Tart and refreshing. Something different to do with rhubarb that's quite good. Made with pea shoots instead of arugula. A bit of salt is added to temper the rhubarb and within ten minutes, you have a savoury salad ingredient – not at all tart! The rhubarb is mixed with thinly sliced cucumber, baby arugula and spinach, squirted with lemon juice and topped with shredded mint leaves. It is a wonderfully delicious, simply refreshing salad. Simple ingredients go a long way for an easy salad for the summertime. Conceptually I really liked this dish, and it tasted good too. My several suggestions are to cut back the amount of salt and to seed and grate the cucumber, then after rinsed thoroughly and drained, squeeze excess moisture out by wringing it in a kitchen towel. Maybe I would have enjoyed this salad more if it were really hot out. Agree with br22 - next time, I'd cut the salt in half at the very least. Maybe my mandoline has gone a bit dull, but it didn't work well with my freshly harvested rhubarb; I gave up and used a knife. This is superb and well worth the effort for a special occasion. When chanterelles are in season, try this one. Can use skinless breasts. Goes well with asparagus. The meat is excessively salty. I'm going to try reducing the quantity of salt in the brining liquid. The sauce is delicious. Page 192. This is one of our all time favorite recipes. The pernot, olive and anchovy separate this from so many other braised short ribs. p.192. Least successful of the short ribs explorations. Though I love fennel and licorice-anisey flavors, this was just too intense for us; the splash of Pernod was particularly regrettable. Used chicken stock instead of chickpea water to give sauce a bit more flavour. Followed CH suggestions to make a one-pot dinner and spinach seemed a tiny bit slimy from sitting. Next time, may try wilting spinach into cooked sauce. Very flavourful dish. Very good. Done with spinach (what we had on hand) and added a bit of hot sauce to individual taste (Tabasco green pepper sauce this time). This was phenominal. I used fingerlings and added spicy sausage for my carnivores. The Herb Jam is delicious and savory - make a double batch of it while you are at it and take it to a party or share a jar with a friend - It is that good. A genius recipe that brings new life to the herbs and greens that linger in the crisper. Who can resist the sensuous delights of a slow-simmered stew, salmon fillet slow-roasted until it is soft as silk, or leg of lamb braised until it is meltingly tender Slow cooking is the hottest new trend in food, and no one better captures the art of sumptuous, unhurried cooking than renowned food writer Paula Wolfert. 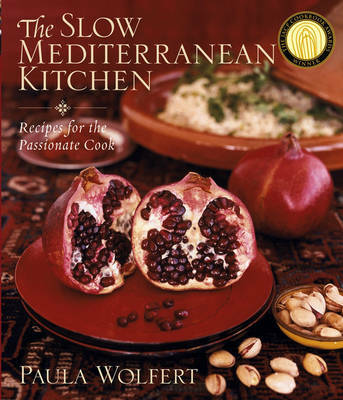 In The Slow Mediterranean Kitchen, she returns to her favorite culinary regions and shares an enticing treasure trove of more than 150 authentic recipes that wend their way from North Africa and the Eastern Mediterranean to Italy, Spain, and the South of France. With her trademark passion for detail and curiosity about cultural traditions and innovations, she offers loyal fans and new converts the secrets to simmering, slow roasting, braising, poaching, and marinating their way to flavor-drenched dishes that capture the enchanting tastes and aromas of the Mediterranean table. Perfect for anyone who loves to cook, this rich resource is a must-have for the bookshelf of everyone who is serious about food. Paula Wolfert (Sonoma, CA) is widely acknowledged to be the premier food writer in America. Her writing has received many awards, including the Julia Child Award, the M.F.K. Fisher Award, and the James Beard Award. She has a regular column in Food & Wine magazine, and her articles have appeared in such major publications as the New York Times, Saveur, Bon Appétit, and Cook's Illustrated. She is the author of six other cookbooks, including Couscous and Other Good Food from Morocco, Mediterranean Cooking, and The Cooking of South-West France.